The Beetle Drive held on Saturday 23rd January was well attended. Several new “Beetle-ers” may have now got “the bug” for this game! There was a “Bring and Share” supper and table quizzes - an enjoyable evening which raised £227 for Church funds. On Saturday February 27th we “made a Song and Dance” in the Church Hall. With entertainment between the three courses, or should that be food between the entertainment! 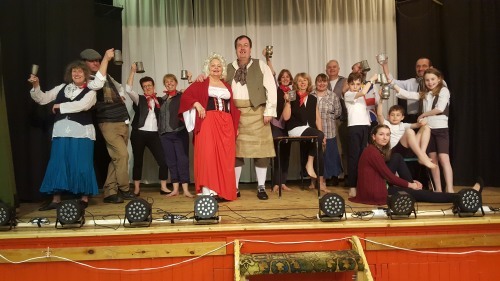 we tucked into a starter of soup, followed by sausage and mash and beans, finishing with trifle and enjoyed singing and dancing, a musical quiz and a raffle. All together £300 was raised. The Women’s World Day of Prayer was held this year on 4th March at Hart Plain Church. The service was prepared by the women of Cuba with the theme: “Receive Children, Receive me”. Translated into more than 60 languages and 1,000 dialects, an estimated 3 million people in 170 countries prayed with the people of Cuba. What began as separate days of prayer in America in the 1800’s has grown to be an important international ecumenical day of prayer. Easter coming so early this year, we had hardly finished the Christmas season at St George’s with the beautiful service “The Light is With Us” containing music and readings of Advent, Christmas and Epiphany, and Candlemass itself (and the taking down of the Church Christmas tree) than we were at Ash Wednesday and the beginning of Lent. As in previous years there were Stations of the Cross at various times to suit as many people as possible and additional Sunday evening services throughout March finishing with Festival Evensong and Devotions on Easter Day itself. The Lent Group, held at Margaret Symonds house had as its subject “Migration and Movement”. This interesting and thought provoking topic, so relevant in today’s world was enjoyed by the small group of seven ladies. Our weekly “tea money” collections totalling £67 has been sent to US, the new name for USPG (who provided the free booklets that we used) to help them in their work. 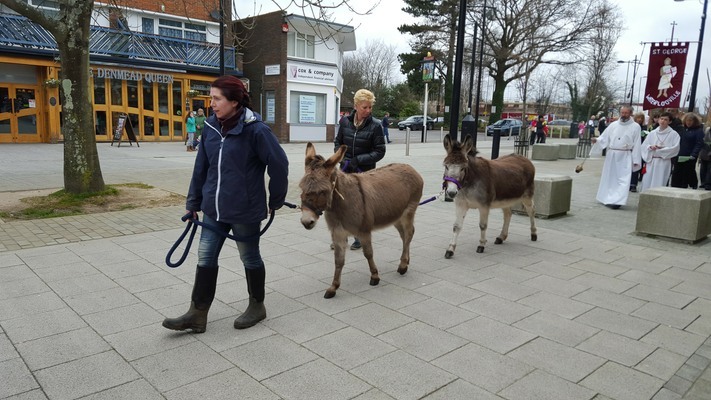 On Palm Sunday morning we gathered, together with two donkeys - Minnie and her foal Mabel (borrowed from Keydell’s Nurseries) and processed around Waterlooville Precinct, holding part of our service and handing out Palm Crosses to any passers by we met on the way, before rejoining the rest of the congregation in church. In Holy Week there were services each evening. On Maundy Thursday our service was in four parts, The Ministry of the Word, The Washing of the Feet, The Ministry of the Sacrament, and the Procession and the Vigil, which ended at midnight with Compline. There were three services on Good Friday: “At the Foot of the Cross” at 10am, a service for children and young people; in warm-ish sunshine at 11.20am “The Procession of the Cross” - we met for the first part of our service in front of the Baptist Church, moved on to the Roman Catholic Church and then to the Bandstand in the centre of the Precinct, gaining more and more congregation on the way. Then our, by now, crowd of people walked through the Friday Market to St George’s to finish our service outside. 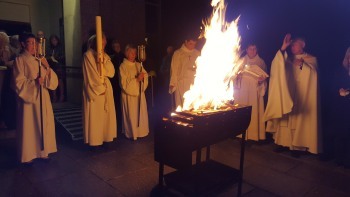 On the evening of Holy Saturday we held a service of the Empty Tomb, followed by the Lighting of the New Fire, no mean feat considering the windy conditions, but at least the rain had cleared for a while. We lit the new Paschal Candle, which this year has been donated in memory of Margaret Anderson who sadly died last year. To finish we adjourned to the hall for an Easter supper of jacket potatoes, various fillings and small chocolate cakes. And so to Easter Day, and again our Procession across the road took place, in the dry, before returning to St George’s. In the evening a small number of us gathered again at church for Festival Evensong and Devotions. A lovely quiet service to finish the Easter celebrations. 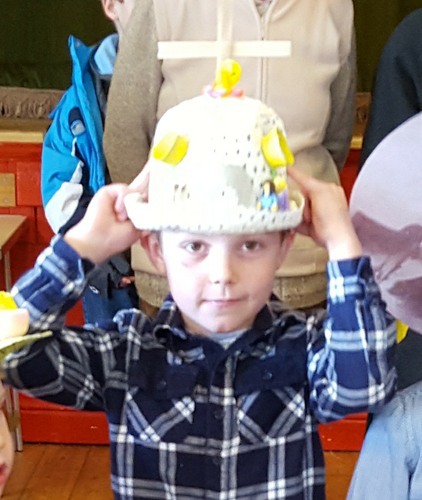 Following the morning service on Easter Day we held an Easter Bonnet competition, which was won by Andrew Clark - (Adult section) and Seth (Junior section).